This sweet girl’s life is about to be flipped, turned upside down–name that TV show. Flipped, turned upside down in a completely wonderful way, but still…things around here are going to be forever different come next week. So I wanted to make sure her days before Scott’s arrival are pretty special and filled with things that we won’t be able to just get out and do once he’s here. 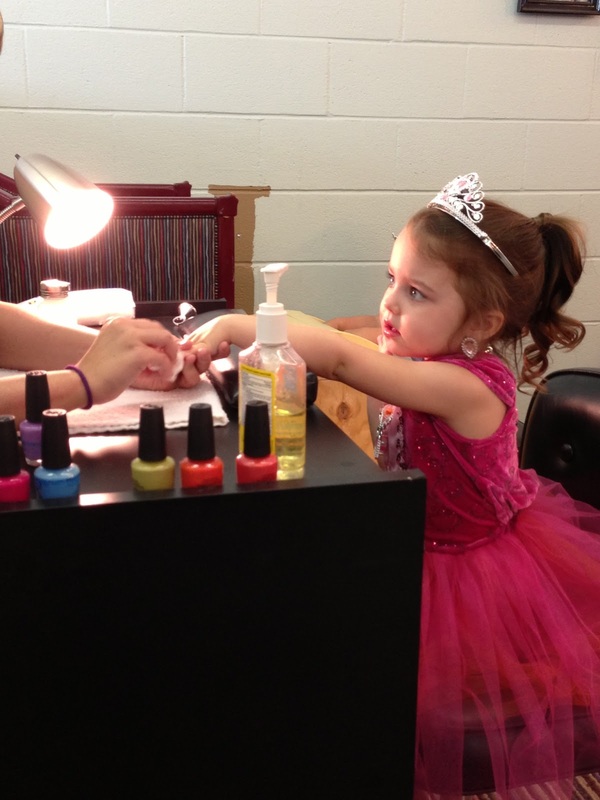 A local salon had an event for little girls today. 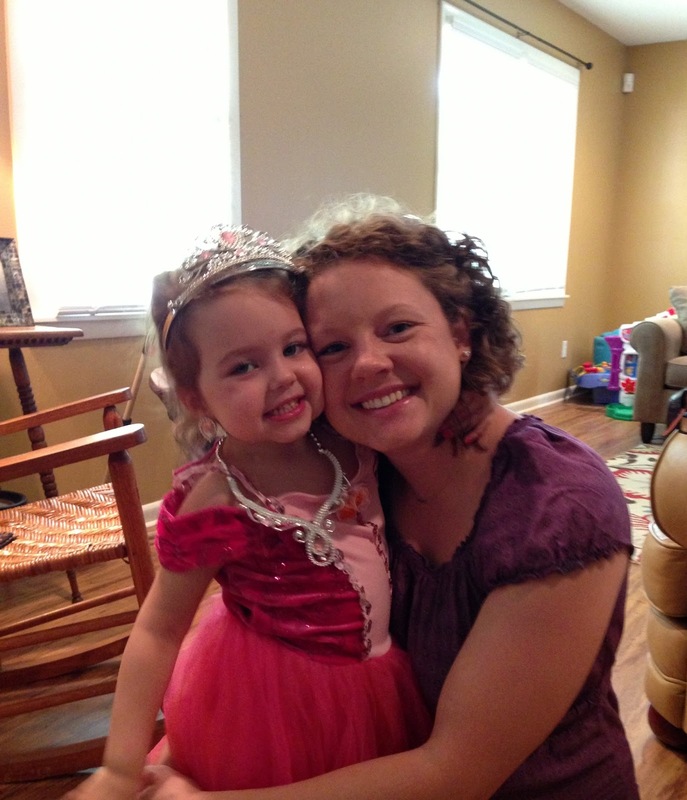 Lily dressed up as her favorite princess (which, by the way, is ALL of the Disney princesses) and she got her hair, make-up, and nails done. 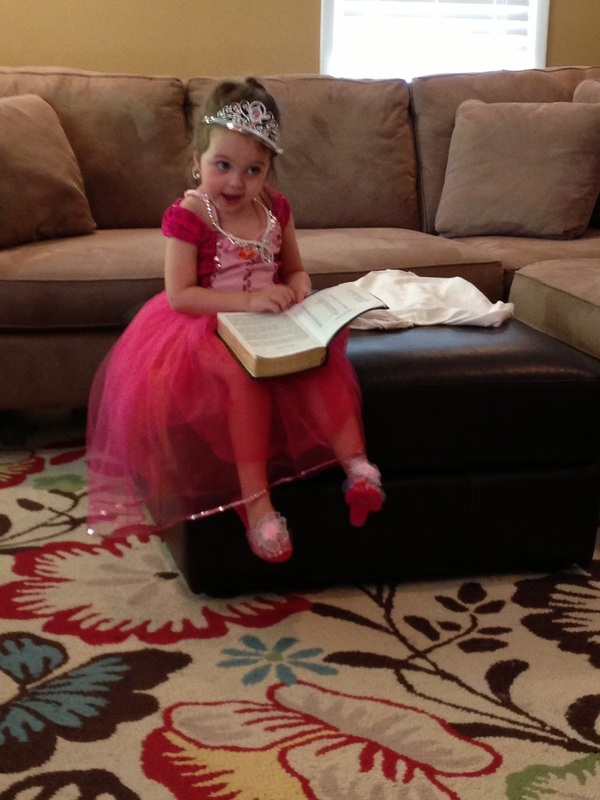 My mom bought her a new princess dress and jewelry and I bought her dress-up heels that she’s been asking for. Can’t beat $6 for 3 pair of dress-up shoes at Ross, even if a bow came off one of the shoes the second she opened the package. Nothing that a dab of hot glue can’t fix. I laid out her princess wardrobe in her chair at the island so she would see it when she came down for breakfast this morning. I felt like it was Christmas. Of course she woke up 2 1/2 hours before we had to be anywhere, but that didn’t stop her from immediately getting dressed up. Then we had a LONG discussion about getting real earrings and she decided that maybe when she turns 4 the pain won’t be so bad. 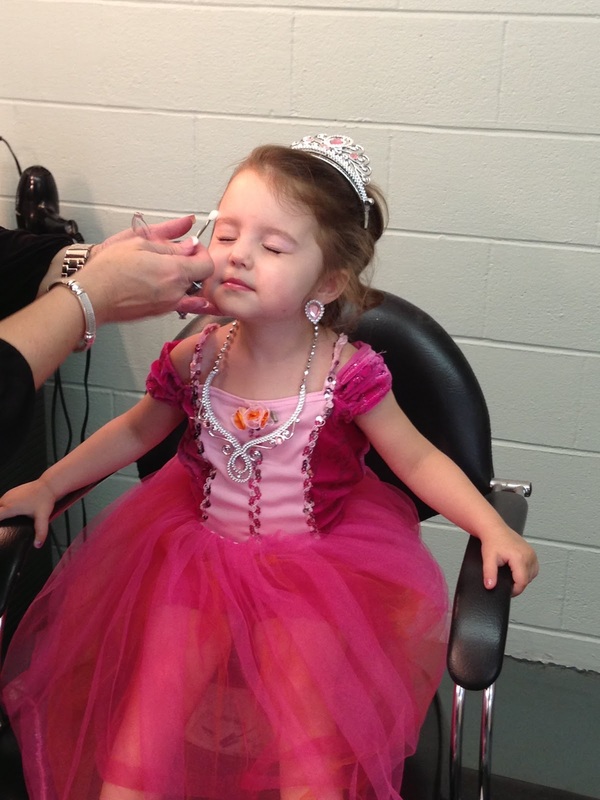 We arrived at the salon for hair first, then make-up, nails, and a cupcake in the princess room. 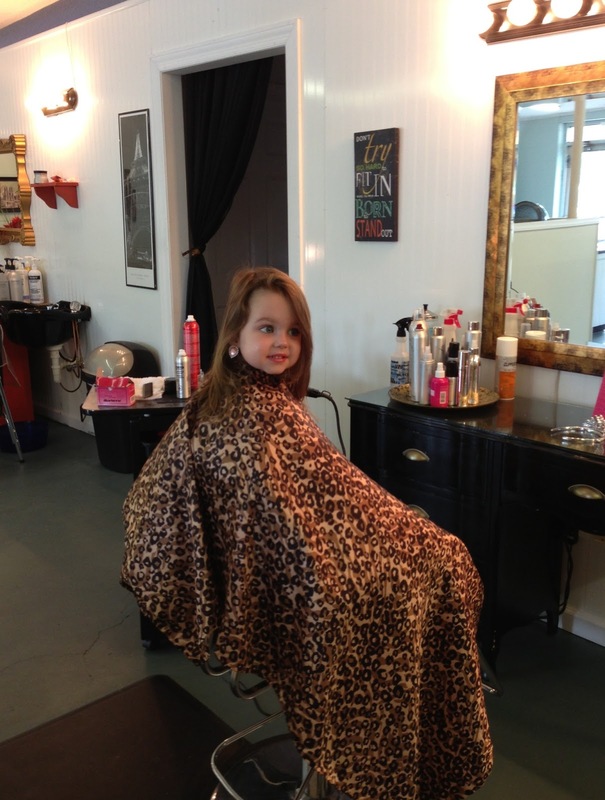 Y’all, Lily CRIED when she sat in the chair to get her hair done. Tears were rolling down her face and she kept saying, “I wanna hold you. I wanna hold you.” I couldn’t figure out what was wrong and she couldn’t tell me through the sobs. So, I held both of her hands and practically laid my head in her lap while the lady did her hair. After hair, she got pink eye shadow, blush, and “eye scara”. Then, she chose purple for her nails. 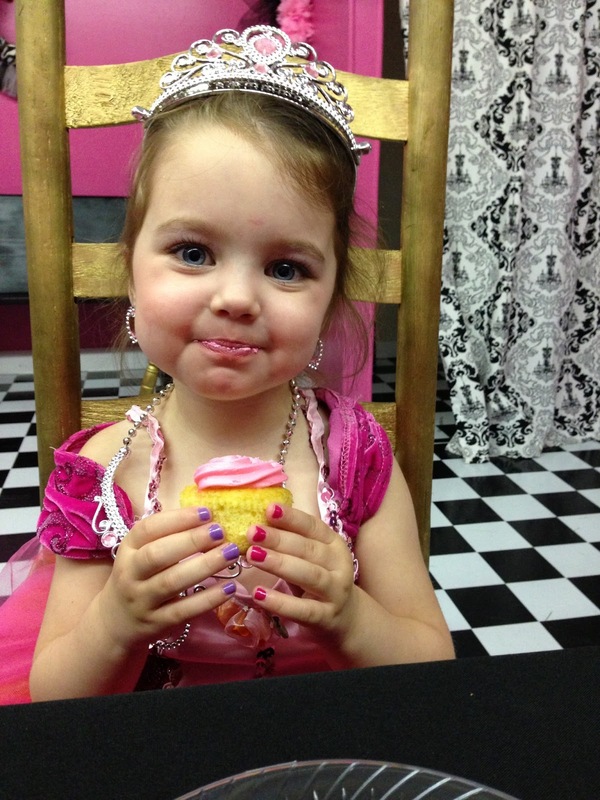 After the lady painted Lily’s right hand, Lily said she wanted pink for her other hand. She likes to switch things up :). However, the lady said she couldn’t do that. Umm, what? Lily insisted, but, again, the lady said she had to do her nails like all the other girls. After the lady said no 3 times and Lily requested pink 4 times, the lady finally gave in reluctantly. I still can’t figure out why that was such a big deal. 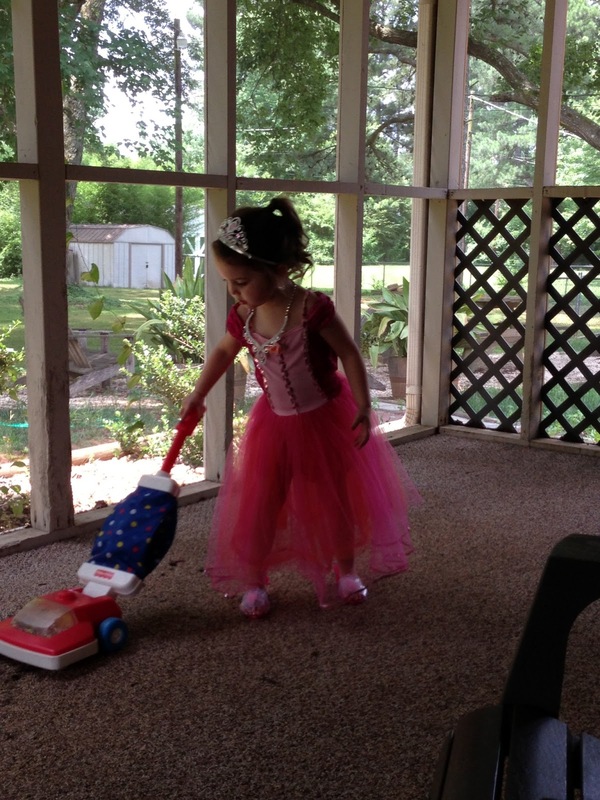 She’s 3. I paid you. Just paint her nails whatever color she wants. 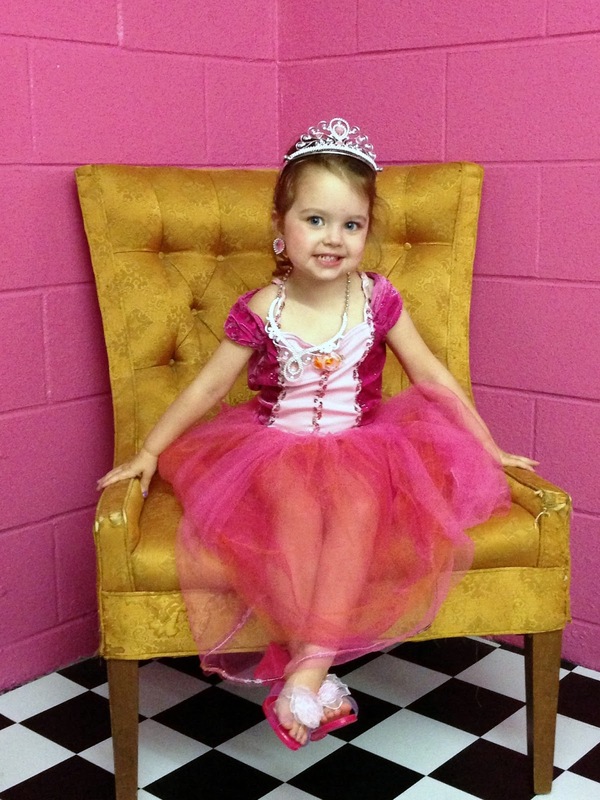 After her nails dried, we went in the hot pink princess room and sat in golden chairs for a cupcake. When we got in the car to leave I asked Lily why she cried in the chair. She said it was because the cover up the lady put on her covered up her princess dress and she was no longer a princess. Very upsetting I tell you. Reading the Bible and telling Daddy that if he goes back to his office to work, he’ll miss out on seeing the (made-up) princess lights on the porch. The princess took a 3 hour nap today, as all good princesses should. 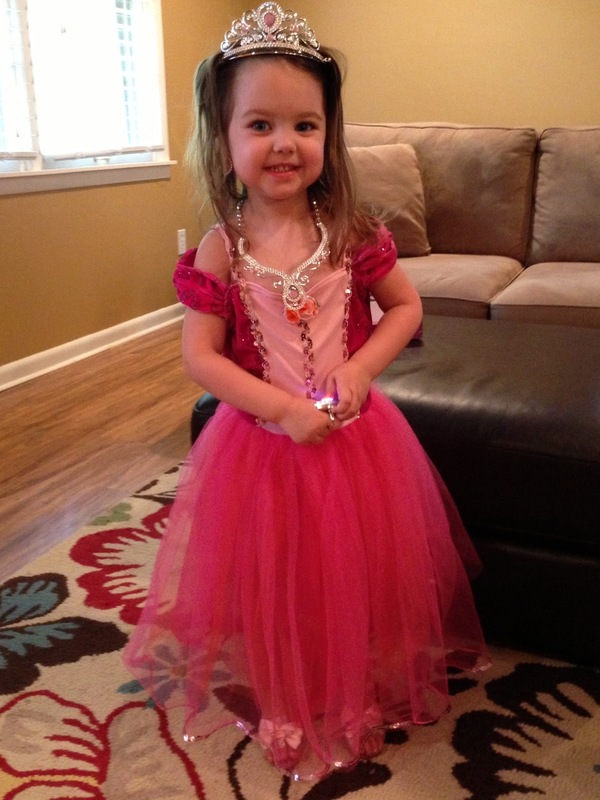 Then we headed to the store to buy ingredients for princess sugar cookies…in complete princess dress up of course. And now I’m sitting next to the princess who just had a bath, about to decorate sugar cookies…again, completely dressed up like a princess. I wouldn’t be surprised if she goes to bed like that :). I love my girl and we had so much fun today!!! We have one more surprise for her later this week, so stay tuned! Oh my gosh. Cutest day ever. Lily looks like she's 7 years old. When did she get so big?!?! My guess for the show: Fresh Prince?